Scientists in Australia are exploring the rainforest canopy using a 50m-high (160ft) crane to zoom around the treetops. It has led researchers to discover a vast amount of new information about the ecosystem, including great numbers of novel sub-species. About 15,000 new insects have been identified in the last four years since the crane was set up in Daintree Rainforest National Park in Queensland. It is the world's oldest tropical rainforest. The crane has a 55m-long (180ft) jib and allows researchers to survey the canopy suspended in a gondola. It gives them direct access to about 800 trees at any one time. "Tropical forest canopies have been called the last biological frontier - we know very little about what's going on," said Nigel Stork, an entomologist at Queensland's James Cook University. "Yet early studies indicate that there is immense biodiversity, particularly insects and fungi," he told the BBC World Service's Discovery programme. "At the same time, it's also the place where the biosphere meets the atmosphere. These forests are actually playing a very significant role in climate and climate control." In the past, scientists have had to rely on climbing up ropes to investigate the canopy, restricting both their access and the scope of their studies. Tropical treetops are thought to be the richest ecosystems on land. They may be home to 40% of all plant and animal species. The numbers of insect species alone may number in the tens of millions. "It's like looking at a cauliflower - with holes, peaks and troughs," explained James Cook's Steve Turton. "This allows for a host of different microclimates - different levels of heat, light and humidity - which is why this ecosystem can support so many species. "Obviously, plants and animals adapt to those sorts of conditions, so there is no other ecosystem that supports anywhere near the same number of plants and animals in so small a space." 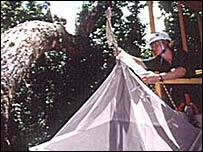 Using the crane, the scientists have placed insect traps with ease, and these have proved particularly valuable. With each additional year sampled, more and more species continue to show up. Crucially, the Daintree Rainforest has the same levels of diversity as in Borneo or Peru. This means the results can be extrapolated around the world. Trapping studies have also revealed that, for example, the prehensile-tailed rat, previously thought to be exceptionally rare, is a common canopy inhabitant. But what needs to be better understood is the extent to which these different organisms depend on one another. The prehensile-tailed rat, for example, has been shown to play an important role in seed dispersal. As it eats the water gum tree's fleshy fruits, it nibbles on seeds and this helps to trigger their germination. Meanwhile, scientists are also using new access to the canopy to understand how trees - and their loss through deforestation - might contribute to climate change. Instruments positioned on the canopy crane are measuring the direction of carbon dioxide flows into and out of the canopy over a number of years and under different seasonal conditions. Andrew Mitchell, the director of the Global Canopy Programme, told Discovery he wanted to double the number of cranes worldwide from the current nine so that science could better understand how biodiversity interacted with the atmosphere. He said that interest surrounded a group of airborne chemicals known as volatile organic compounds, which were released from plants into the atmosphere. In canopies, this occurs in vast amounts. "New research is suggesting that these chemicals oxidise with sunlight to create condensation nuclei - around which water droplets form," Dr Mitchell explained. "They call them 'green ocean clouds' in the Amazon. The crucial thing is these are low, warm clouds, and they release very gentle rain. "It may be that if we can look at these kinds of functions, we may well be able to ascribe a better value to these forests, because of the enormous power they may have in helping to maintain rainfall patterns." Part Two of The Last Great Wilderness is next Monday 1 May at 0900BST on Radio 4.